Dear friends, guests and partners – We are very happy and excited to announce that Andaman Discoveries was selected as a finalist for this year’s Wild Asia Responsible Tourism Awards! This annual award recognizes best practices and innovative programs for sustainable tourism in Asia since 2006. Along with basking in glory and honor of the award reception, the winners can exhibit at the ITB Asia in Singapore for free! We are now entering into the final stages of the award process and hope to gain our second success as ‘Winner’ for the category “Best in Cultural Preservation”. We have been awarded ‘Winner’ of the category “tour operator” in 2010. Our entry into this competition focuses on efforts to preserve, enhance and promote local cultures and heritage. 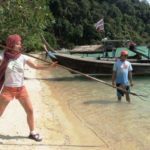 Our unique community-based tour program on Koh Surin represents exactly these goals, as it empowers the indigenous Moken people to showcase their exceptional way of life and derive benefit for their community from tourism. Visitors have the chance to experience the remarkable underwater worlds of Koh Surin with a Moken guide. The Moken have lived immersed in marine environments for centuries and have a vast knowledge about nature. Visiting the village with a Moken guide gives the tourist the chance to learn about their traditions in a respectful way and engage in cultural activities, such as basket weaving and spear fishing. 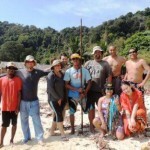 Find out more about our tours with the Moken: https://www.andamandiscoveries.com/surin-islands-tours/. By employing a bottom-up approach Wild Asia aims to make business more sustainable and guide them in creating a better environment for their employees, local communities and surrounding biodiversity. Besides hosting the Awards, Wild Asia’s Responsible Tourism Initiative also provides training and consulting services. It is a great honor for us to be nominated again and confirms our ongoing efforts to facilitate local development through community-based tourism in Southern Thailand. We are competing for the award with another inspiring social enterprise based in Laos: “Ock Pop Tok” which helps visitors learn about the fascinating world of traditional Lao handicrafts, textiles and design. Have a look at their work here www.ockpoptok.com. In the next step, the Wild Asia Jury will come to Kuraburi for a site-visit and assess our program based on what our references have to say about us. Stay tuned for updates! Find more information about the awards here: http://tourism.wildasia.org/3046/2014-finalists/. If you want to know more, feel free to contact our Experts or send us an email at info@andamandiscoveries.com. Thanks!